PuzzleMad: An "Ultimate" puzzle - maybe it will be yours soon? An "Ultimate" puzzle - maybe it will be yours soon? This beauty is currently the only one of its kind in the world just now (hence the 1 next to the signature). Hunter Palshook initially made me a couple of puzzles which I absolutely love and we have struck up a good friendship since then. 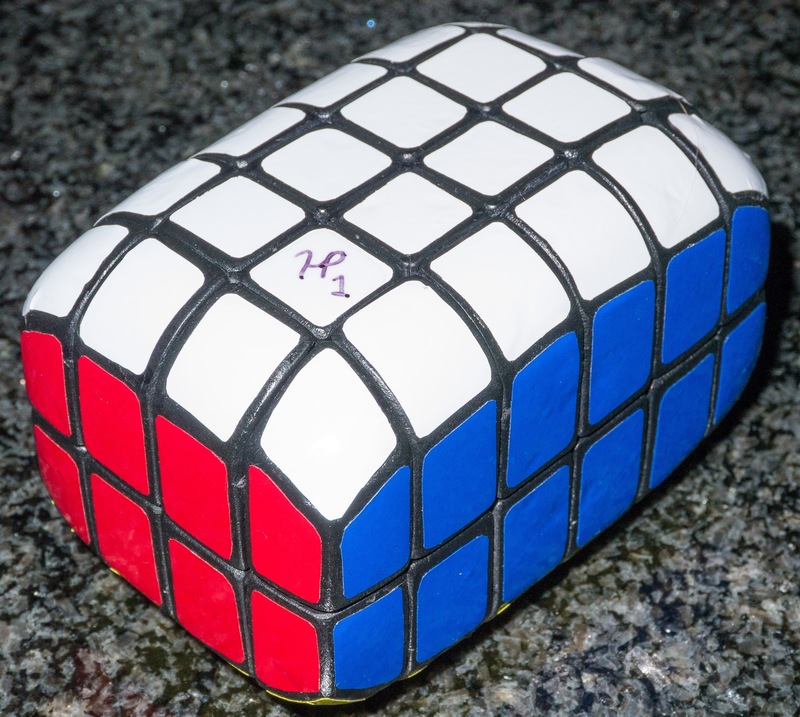 He posted on the Twisty Puzzles forum that he had managed to create a new puzzle - this is the 2x4x6 cuboid pictured above - it is the smallest memeber of the category that has been named the "Ultimate shapeshifting cuboids". 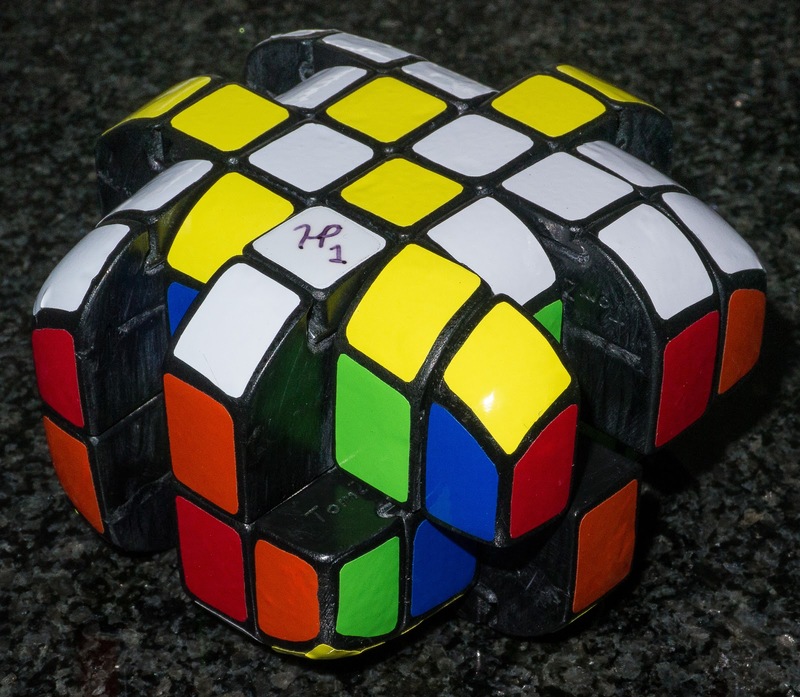 Hunter managed to make one from one of the TomZ's 4x4x6 cuboids. Looking at it, it is clear that an enormous amount of work and skill has gone into it's manufacture (including beautifully hand cut stickers). He decided that he would let me have it - but on one condition! He had been in talks with Calvin (from the HKNowStore and Calvin's Puzzles) about the possibility of this puzzle being mass produced. After all it's basic mechanism is based on one that Calvin already has the moulds for the 4x4x6 and it should not be a huge amount of extra work to adapt them to this puzzle. After a while, Calvin lost interest due to other pressures of work and so Hunter decided to let me have it but only if I would send it back if Calvin should ever decide he was interested. Well it arrived about 2 weeks ago along with my version 2 of his 4x4x2 floppy cuboid (I had broken version 1 irrevocably). I am completely addicted to this group of puzzles and now have a 4x4x2, 5x5x3, 7x7x3 and 7x7x5. 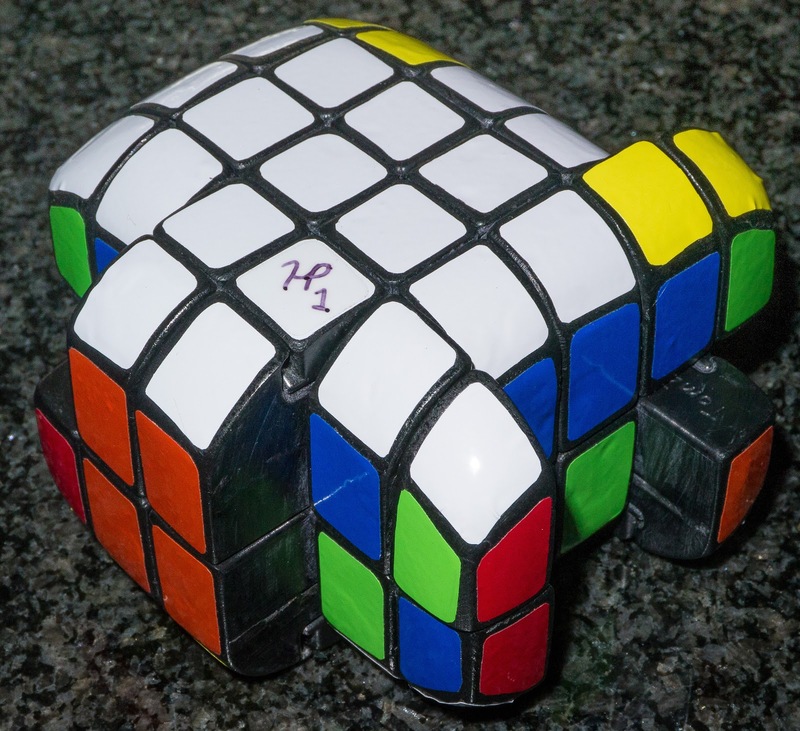 After an initial hesitation I scrambled it and with some difficulty managed to solve it. Over the last couple of years I have bought a lot of puzzles from you and I respect your business and the way you treat your customers. 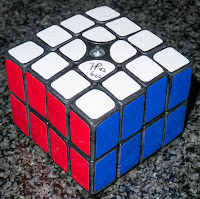 I am aware that you have been in discussions with Hunter Palshook about possible mass production of the 2x4x6 cuboid which he produced by modifying your 4x4x6 cuboid. I have acquired the puzzle from Hunter and have spent the last 2 days working on it and have finally solved it! I have to say that it is an absolutely fantastic puzzle. I am writing to express the sincere hope that you really do consider going into production. The mechanism is obviously identical to the 4x4x6 and only the outer parts have been changed. This would mean that the development process for you would be greatly decreased and you know you would be able to produce a great and very stable puzzle. There is one group of twisty cuboids which has never been mass produced and really should be. This is the so called "floppy cuboids" which occurs with a cuboid of the form N x (N + E) x (N + E) where E is any even number. 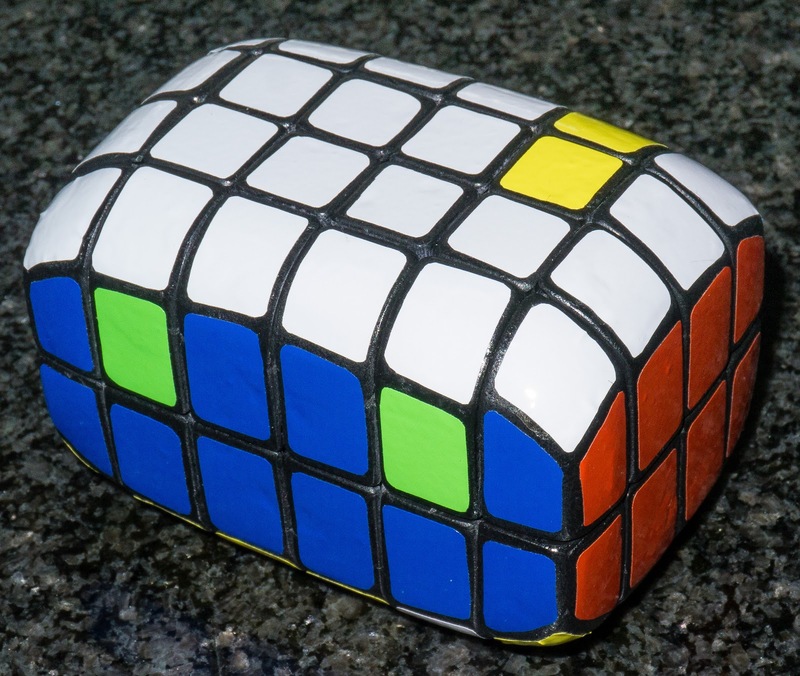 The classic ones that have been produced by Shapeways or mods are the 4x4x2, 5x5x3, 7x7x3 or 7x7x5. I have these from both Traiphum and Hunter and they are great. A subgroup of the floppy cuboids occurs when there are 2 different even numbers. 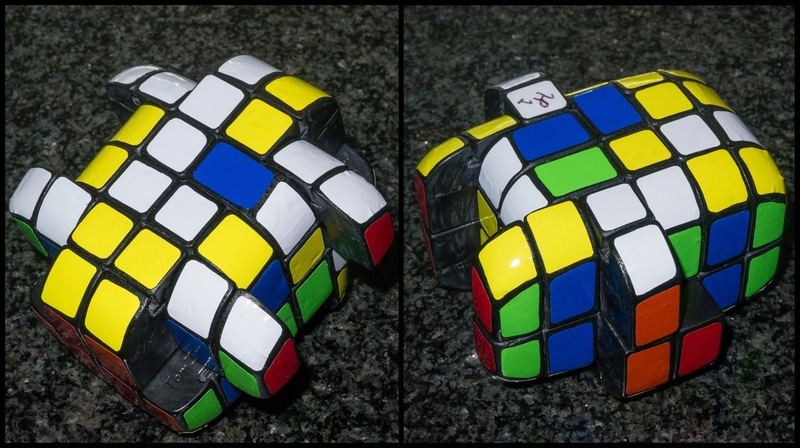 These have been called the "Ultimate Shapeshifting cuboids" and they are amazing. They exhibit shapeshifting in every direction, bandage themselves and also show all 3 different types of parity. Amongst this group are the 3x5x7 from PuzzleMaestro and Claus' 5x7x9 - both available at enormous cost from Shapeways. This means that no-one can really afford them. Hunter has produced the smallest of this group, the 2x4x6 and it exhibits ALL the fun elements you get in the bigger ones but is much easier to handle and hopefully should not be too tough for you to manufacture due to the fact that you already have moulds for the underlying puzzle. I implore you, please see whether this can be made commercially available. 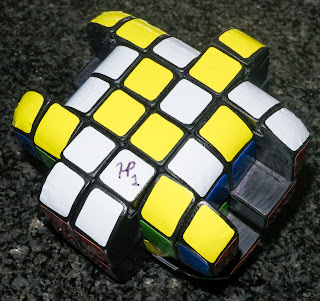 I think the twisty puzzle community will thank you for it. Unfortunately for me but probably fortunately for all of you, Calvin replied to me the following day that he was restarting looking into it. So this weekend I have to send my lovely 2x4x6 cuboid back to Hunter!! Damn - I'm really not very bright!!! Hopefully after you reading this blog post you will all feel the urge to email Calvin and clamour for him to make this cuboid available. The 5x7x9 may be mass produced in the future but the development time for this could be years so in the mean time we all need just one of this very challenging group. For the rest of this article I'm going to describe the scramble and my own solve process in very broad terms. These puzzles start to bandage very quickly (i.e. 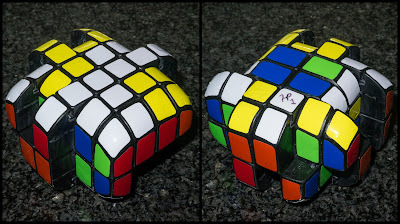 they lock pieces together) when you scramble them - this becomes effectively just a 2x2x2 puzzle. So it is important that it is done in a certain way to get the best scramble. The first thing to do is scramble as much as possible using 180º turns in every direction. After you have done the pure 180º turns you still have the standard cuboid shape but then you can introduce 90º turns along just one axis - parallel to the flat part of the cube (horizontal to the table) and mix this with 180º turns perpendicular to it (front, back and sides with slices). After this it starts to look nasty but this is not much different so far to one of the brick group like the 2x3x4 or 3x4x5 puzzles that have been mass produced already. Finally, it is time for random turns in all directions of all faces and slices. What a mess! Now there will be lots of different approaches to solving these and I welcome comments and communication (below or via my Contact page) to tell me how you might approach this one. I will explain what I have done to solve it although not give the fine details of algorithms used. In the picture above you can see that the corners are correct but the centres are completely mixed up. The next step is to take the corner solved puzzle and twist the inner slices (and possibly the outer ones) about to rearrange the centres trying to achieve a flattened puzzle if it's not possible then group the centre types as much as possible. In the picture below on the left the centres are already flattened and on the right the centres and edges are pointing the wrong way around. On some cuboids this would make the puzzle irregular in shape but because of the way this was made it is not so obvious and can confuse you for a while before you realise what is needed. I think it took me a few hours to reason this bit through. If you know SuperAntonioVivaldi's system then here I start to "Redbull" the puzzle - twice! Centre types grouped - Redbull anyone? The Redbull algorithm is my way to sort the parity found in even order puzzles - I use it to flip a pair of edges. In the example above I flip both on the right hand pic. This then leaves you with a flattened puzzle. Once flat, the next step is to reduce it to an easier type of puzzle! 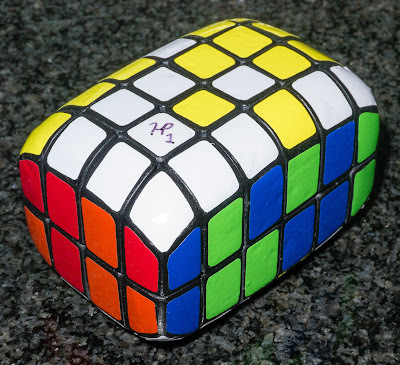 Anyone fancy solving a 3x3x2 Domino cuboid? 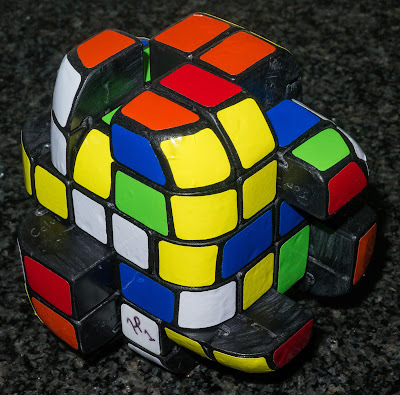 Well before we do that, I reduce the edges reconstructed double edges - I have found that 50% of the time I get the dreaded even order edge parity here where I can pair up all but the last 2 double edges - it is great fun to resolve that problem with this cube. Next reconstruct centres and the most confusing part is over! Or is it? Finally you treat it like a 3x3x2 Domino cuboid which ends with the puzzle back to the proper shape - from here you then solve the puzzle the same way as a Brick cuboid by swapping pieces across the faces - will you get any of the Brick parities? The first time I solved it I had lots of brick parities involving both layers just as you see in the picture below!! It caused some headaches. It's a Brick - spot the 2 separate parities here! As you see that there are multiple phases to this puzzle with parities at every turn. 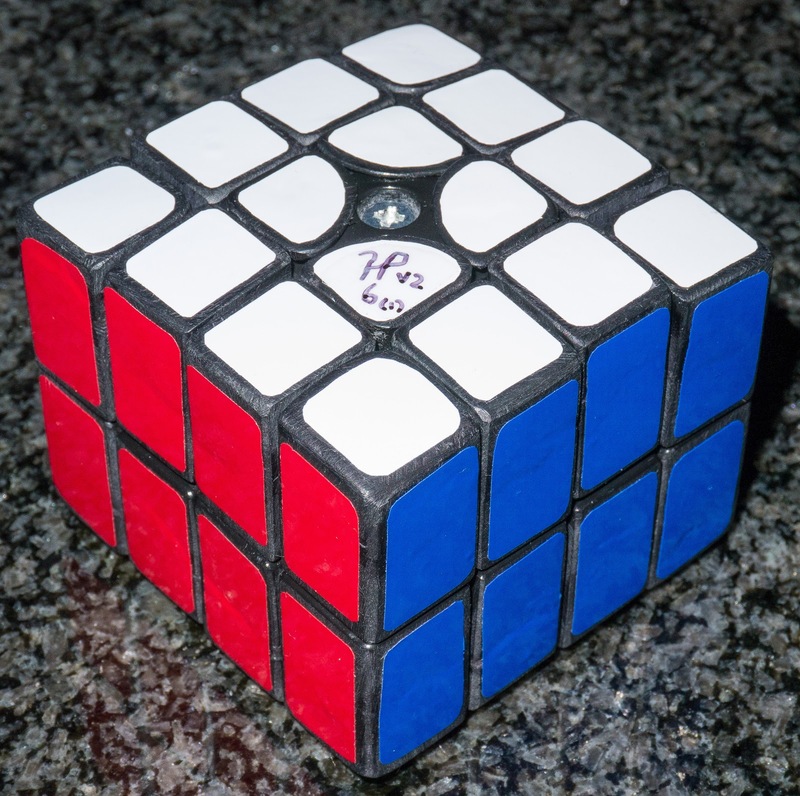 It is not quite as tough as the 3x5x7 but it is pretty nearly so and is great fun. To all you non-twisty puzzlers out there - why have you read this far? If you have then you must have a small wistful hankering for them. Go on try it! You know you'll like it! Start here. That should keep you occupied for quite some time!!! Great article Kevin. I'd definitely buy one of these if they were mass produced. I'll do what you suggest and email Calvin at HKNowStore. Thanks Joe, every bit of pushing really helps! It's good to have a puzzle friend... Or is it?